Where to begin with 2018? It was, without a doubt, the hardest year of my life, starting with the unexpected death of my dad in January and followed by the infinite ripples outward from that moment. But alongside the grief, pain, shock, sadness, fear, frustration and anger, there have been joy and love and kindness and hilarity and understanding and sympathy and so much more. Sometimes all at the same time. Which brings me to the rainbow. One of the first photos I took with my new lens and camera in February. Made the snow look magical with #nofilter. It was February, and I was driving home from Dallas (the Oregon one) after visiting my favorite camera shop, Focal Point. I’d been purchasing a new lens, and the woman helping me said how lucky I was to be getting this particular piece of equipment, that I’d be very happy with it. I started crying, explaining that I was actually using some inheritance money for it and that my dad had recently passed and that it all just felt so weird. She teared up too and told me he’d support the purchase knowing that it brought me happiness. I said he was one of my biggest fans. We agreed that he’d be with me whenever I used it to make pictures. Minutes later, driving home, I spotted a rainbow. It brought a smile to my face, but it turned to wonderment as the strangest thing happened. I kept expecting it to do that thing where you go around a curve and the rainbow disappears or disintegrates or the angles of refraction just aren’t right anymore. Instead I just got closer and closer and closer to it, until what seemed to be the end of the rainbow was right alongside me as I drove. It stayed that way for the entire drive toward and across the Marion Street Bridge. Then it finally dissipated, but the memory stuck with me. I would have loved to tell Dad about it, but it made me think, maybe he’s here with me after all. Since then, when I’ve been shooting with that lens (and my replacement camera), I’ve felt him there, cheering me on as I’m making my art. Lucky for me and my heart, my chances to create and capture have been many this year. 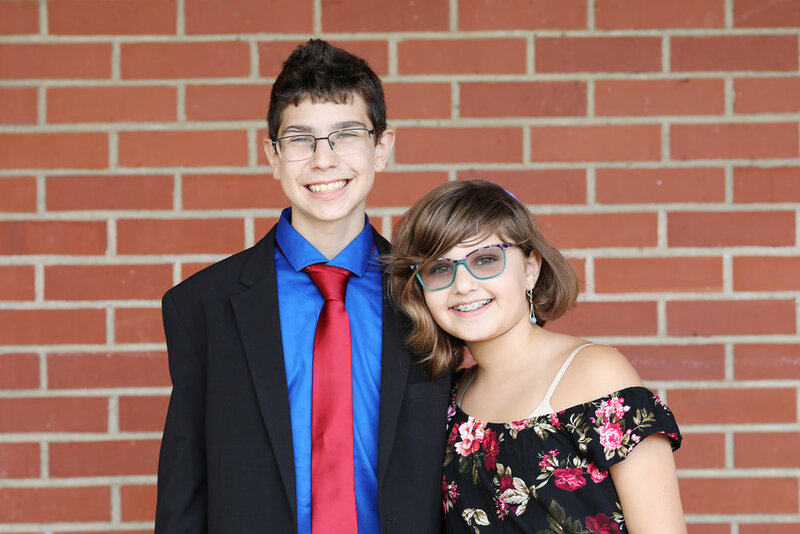 First, the b’nai mitzvah! Being Judaism-adjacent for the past couple of decades thanks to Judah, I’ve been to several such ceremonies. I have even photographed a handful over the years. But this year, our synagogue’s b’nai mitzvah class was huge, by Salem standards, and I ended up photographing five over the past nine months. They’ve quickly become one of my favorite events. 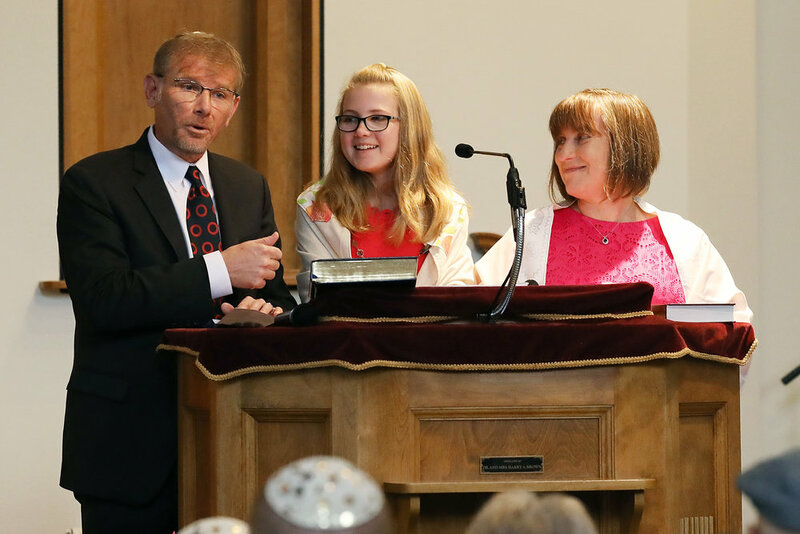 Seeing these kids’ hard work come to fruition as they lead services, chant Torah, deliver speeches regardless of their level of nerves and are the subject of speeches by their family … it’s just magic. And in a tough year marked by loss, it’s been glorious to see families celebrating and recognizing one another while everyone is still around (i.e., not at a memorial service). Let’s not fail to note that I’ve gotten really good at shooting and bawling simultaneously. 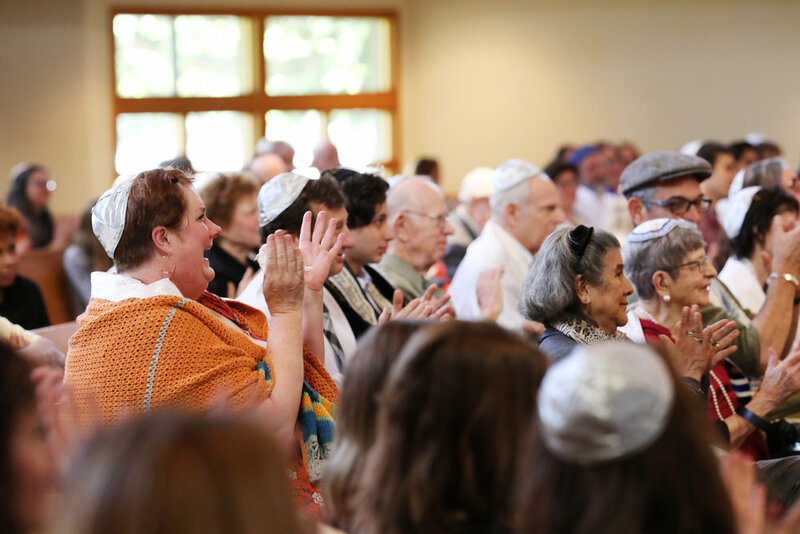 These events have become part of my grief process, both due to bearing witness to parents showering their children with love and joy and pride, and due to the Mourner’s Kaddish. As I already mentioned, I’ve been Judaism-adjacent for a long time. But my dad’s passing was my first loss since being a synagogue member, so it was the first time a direct family member of mine made the list read before the prayer recognizing those who have had a loss in the past year or who are marking the yahrzeit of a prior loss. 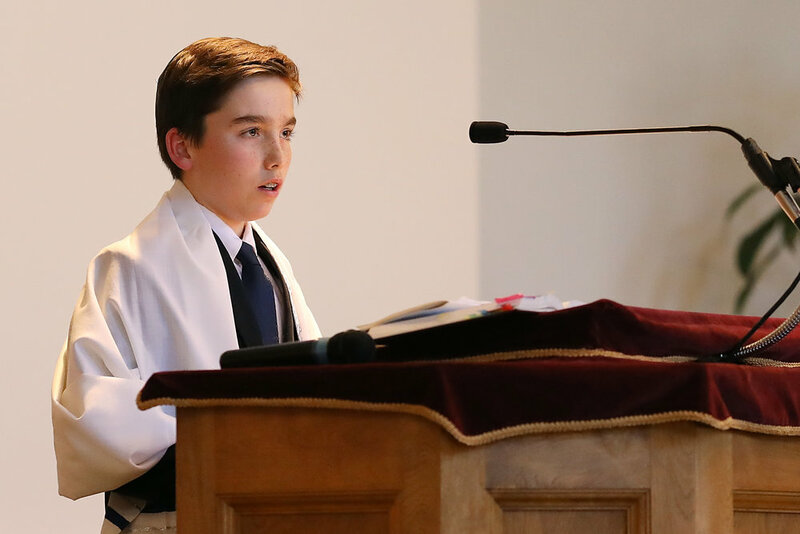 I was shooting Jack’s bar mitzvah in March when I heard my dad’s name read from the bima for the first time, and I was immediately overcome. I stood, I cried, I said his name, I took it all in as we recited the prayer, and I cried through the rest of the service, even as I kept documenting. 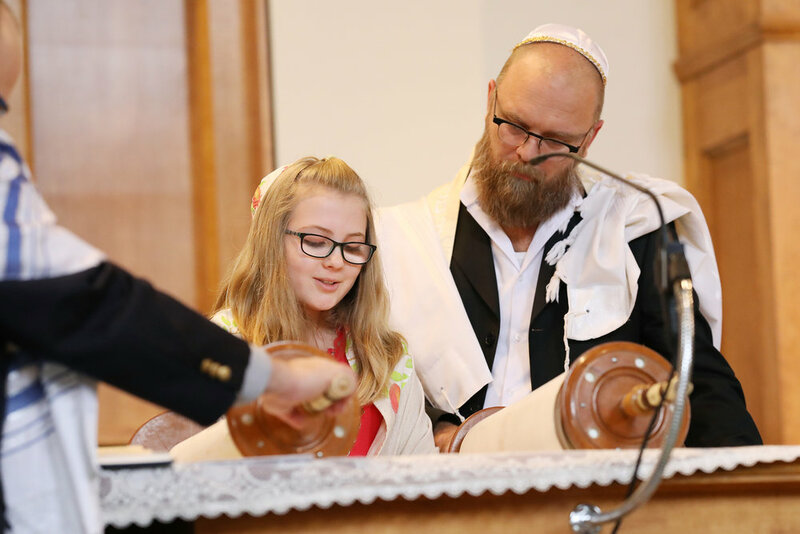 During Isabel’s bat mitzvah, I thought I was a little more prepared, but the Mourner’s Kaddish was preceded by a speech by a father to a daughter that just grabbed me by the heart and squeezed. Cried through the rest of that one too. His memory and some tears accompanied me through the other ceremonies this year, but I kept it slightly more together. Still, I felt him with me as I peered through my lens, as we recited the prayer, as I bore witness to and documented these families’ joy. 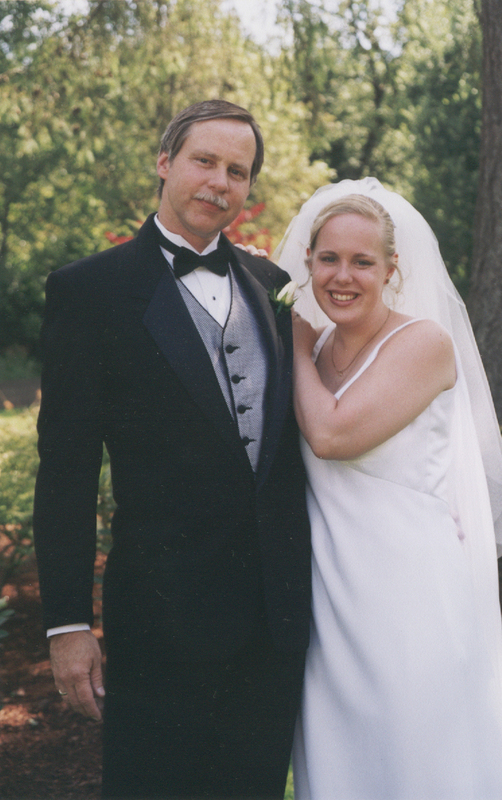 Speaking of joy, I had often talked with my dad about wanting to shoot a wedding someday. I’d shot *at* weddings a couple of times (always staying out of the way of the pro, of course), but never as the hired photographer. This year, that wish came true, and I had the privilege of photographing four weddings, all so different, all so beautiful, and all perfect reflections of the couples. 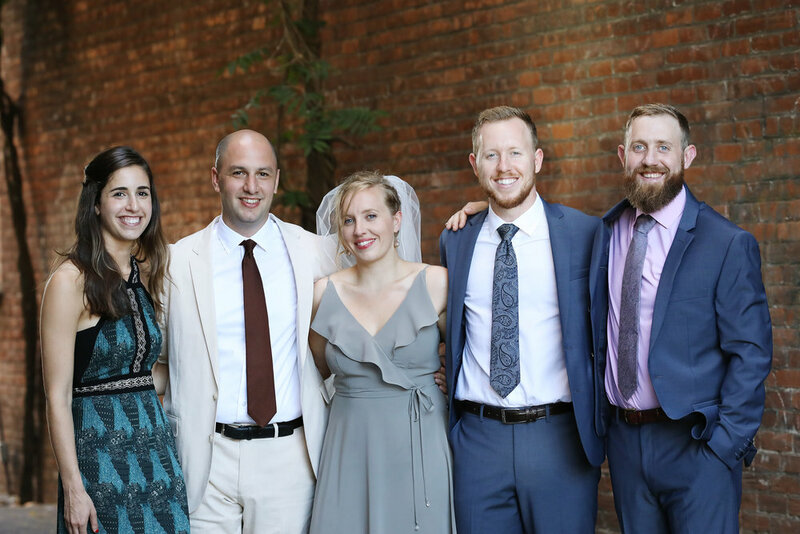 In the spring, there was Forrest and Brena’s lovely short ceremony with family and then a party for friends. 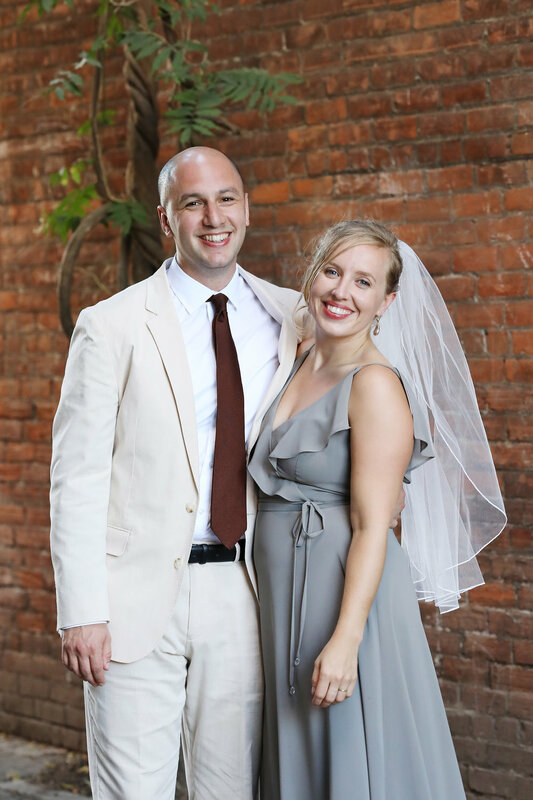 In midsummer, Mari and Dan exchanged vows at the Reed Opera House in a gorgeous ceremony with some of the most hilarious and sweet toasts I’ve ever heard and a super fun reception. On a beautiful September morning, Pam and Dan (different Dan!) 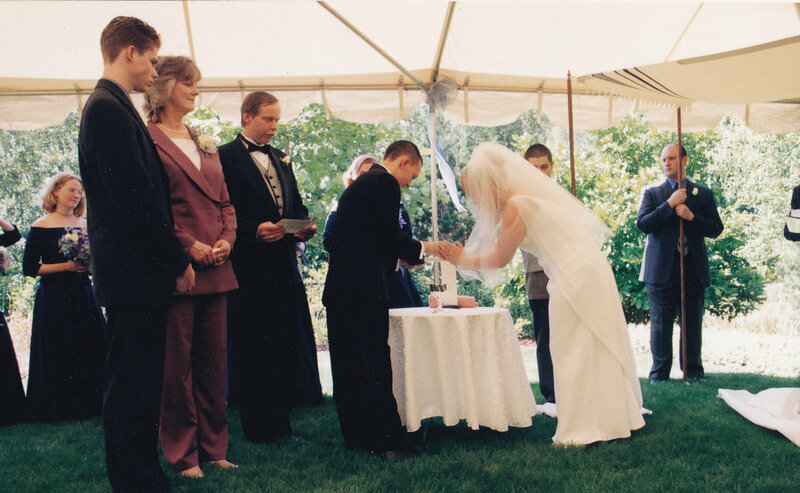 stood before their friends and family in the gazebo at Keizer City Hall and pledged their love to each other. 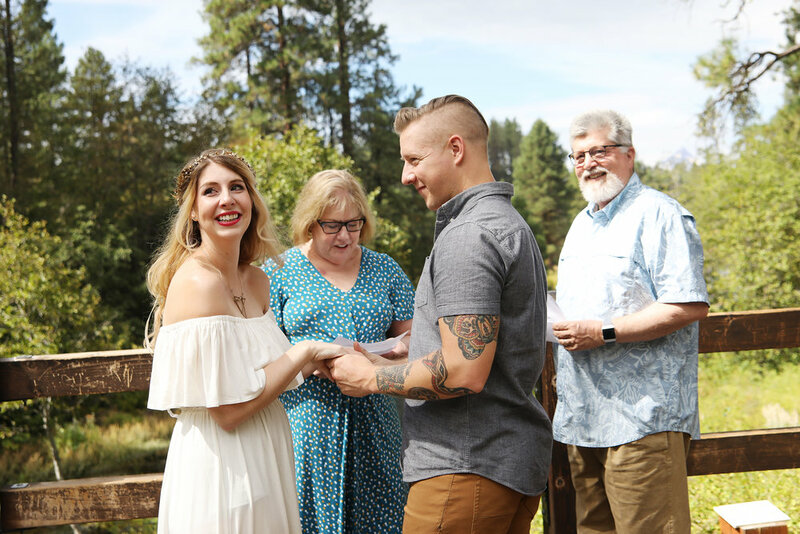 And in August, my sister Kate married Russell at the headwaters of the Metolius River in a perfect window of clarity during a day of smoke and sprinkling rain. How did I get so lucky to be the person documenting all these wonderful days? That doesn’t even encompass the many wonderful family shoots (including the Bakkens for the sixth consecutive year and the new baby of one of my dearest friends) and two fun fall senior photo shoots and a couple of corporate head-shot sessions … and let’s not forget the sandwich on the side of a bus! “Take your broken heart, make it into art.” That’s a Carrie Fisher quote that has been my guiding light of late. Making photographs for all these amazing people has nourished my creative spirit during this challenging year. Thank you to all who entrusted me with this task in 2018 (and before! ), and may we all find moments of joy to carry with us through 2019. To understand why today was funny and sad and weird, you'd have to know how much I hate the dentist. I mean, not the people themselves, but the whole experience. It's a long several stories involving knocking out my baby front teeth, elementary school brace face encountering a metal pole, an anxiety attack while on nitrous oxide for the only time, and a root canal where the root was removed before it was totally numb and while I was in the throes of postpartum hormones. Even the short version is long. To understand why today was funny and sad and weird, you'd have to know that my dad, a pharmacist, was my go-to for any health-related situation. I talked to him about the weirdest stuff -- and the most mundane -- and when I was panicky about something (like, say, the dentist), he was good at calming me down. So today I ended up with a decision: Get an appointment for a much-needed root canal in a month or literally RIGHT NOW. Given how distressed people had looked after seeing me get hit with a pain wave after a cold drink or a hot dinner, I knew the latter was the right choice. That was good for another reason: less time to get worked up about it. I got there as fast as I could and got processed and got started with the appointment. After getting through the anesthesia process*, the doctor got down to business. I soon realized that things had changed since my last root canal: The doctor isolated the tooth he was working on with a dental dam (which I had only heard about prior in a VERY different context), which kept all the spray and materials and uhhh tooth pieces? away from the rest of my mouth, which made me realize much of my dental anxiety is claustrophobia caused by trying to keep all that away from my throat. The point being: I actually relaxed. They had music playing, and unable to talk or even really grunt to participate in a one-sided conversation, I closed my eyes and focused on the tunes instead. About two-thirds of the way through, I heard a riff, and my eyes went wide and began to well up. It was the beginning of Pink Floyd's "Wish You Were Here." Immediately, I thought, this is not going to end well. They'd skipped a couple of other songs (including "Welcome to the Jungle," to my dismay), so I knew that was an option. Me: *pointing toward speaker* "TONG"
Them: "Oh, the music? Uhhhh, louder?" Me: "No! ... *twirls finger* "KIP? NEX TONG?" Them: "Uhhhh, oh! Skip this song?" The doctor, kind of realizing what's going on and wanting to break the tension, cracked a joke: "[Assistant] gets like that too, but it's when she hears Pitbull." I guffawed, as much as a person can guffaw with a doctor elbow-deep in her mouth along with a bite guard and a sheet of plastic. It was about this moment that I realized that because of the angle of my head, the tears that had leaked out of the corners of my eyes were collecting in my ears. Everything suddenly felt so absurd, I started cracking up. They thought I was crying again and then realized I was laughing. They were so confused, which made it more absurd, which made me want to tell my dad about it, which made me sad again, which made me tear up again, which landed more tears collecting in my ears, which made me laugh again. So you see, funny and sad and weird. I eventually got myself together, and they completed the procedure (some of the least painful, most extensive work I've ever had, truly), and once I could talk again, I explained. Not all this, but some of it. "My dad died a few months ago, and that song ..." *choking up* They got it. Also, they gave me freshly picked blueberries. So today was an experience. I can't tell Dad, so I'm telling you. I tripped and fell hard into my pain this weekend. It was embedded in the wall of an unexpected chapel tucked away in the woods on a campsite. Polished rocks, gems, minerals cut into thin sheets, their beauty revealed to the light of day, were installed in the outer walls of this perfect little building. 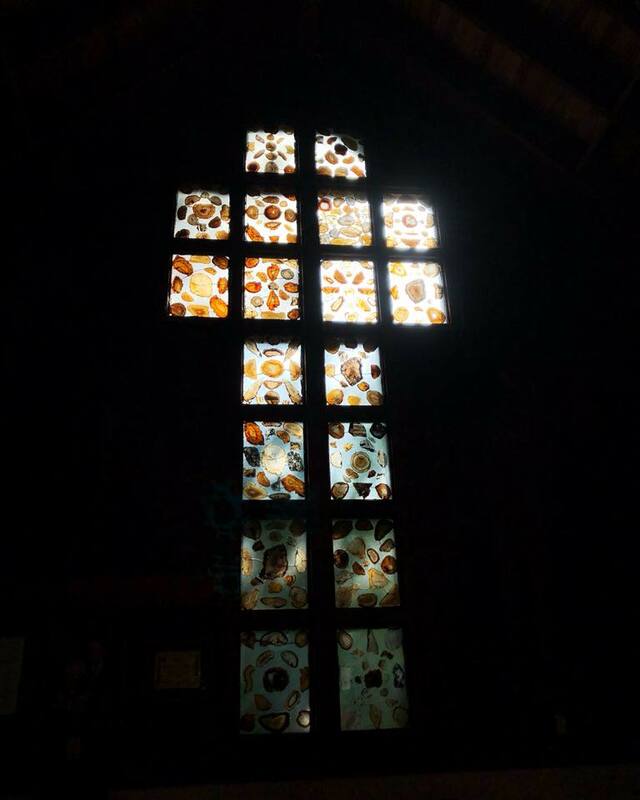 Inside, panes of rock substituted for stained glass, uncovering their glory as the rays of light found their way through. The light exposed the details of the rock and allowed me to begin to make out the sharp edges of my pain as well. Dad was my rock, stalwart, always there even when distance meant he wasn’t there. And man, did the man love rocks. At museums and gem shows, he was gleeful seeing how much nature and the Earth had to offer. If he’d built his dream building, it would have looked like this. How had we not thought of this? How could be not be here for me to share with him? I walked by the first time, and took note of a bench. What I would give to sit here with him and just marvel at this place. The second time, I noticed the rocks in the walls. The third, someone had propped open the door with a boulder, and I stepped inside to see that makeshift stained glass -- and two walls lined with cases of still more rocks. There was that smoldering ache -- always there, but the burning feeling was growing. Then that night, a song I’d never heard before laid bare the pain in my heart. A daughter and father sang to us around the campfire, and the lyrics breathed life into the embers of my smoldering ache, turning it into a raging fire. I wept silently, and a friend noticed and embraced me. I made it through the song, then escaped. I passed the chapel, pressed my hand to the wall and wept some more, then fled to the cabin. I was engulfed but I couldn’t sit with the pain and try to coexist with so many eyes around. I took what I needed -- time -- and drove home alone with my thoughts and my tears and my memories. At home, I found the song on YouTube (“Rivers and Roads” by The Head and the Heart) and played it on repeat while I scanned in a stack of old photos of Dad for a Father's Day remembrance. I raged, and I cried, and I sang along, and I remembered, and I loved, and took it all in until I could sit with it again -- until it was embers instead of a firestorm. For the time being, anyway. 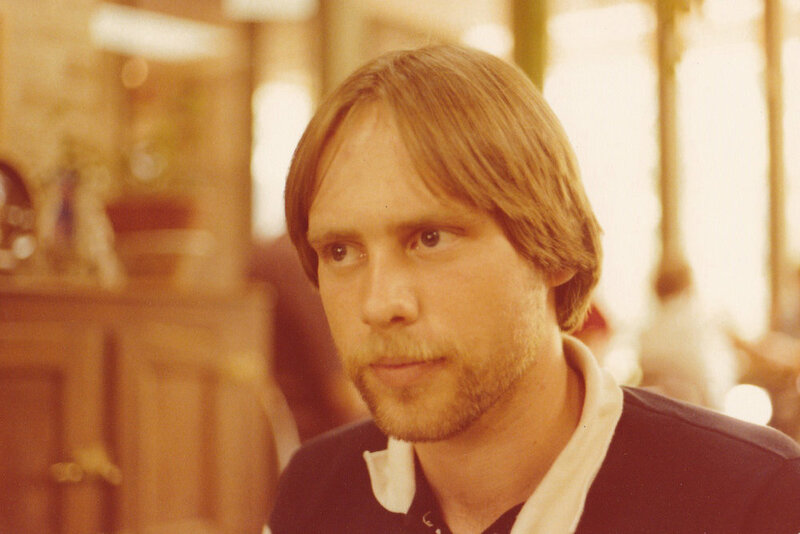 A long time ago, in a galaxy far, far away, my dad Ron Kickler hung the moon. So it’s always seemed to me, his little girl. He had the biggest heart, and the biggest imagination. If you knew my dad, you might have known how much he loved science fiction and fantasy, but especially the universes of “Star Wars” and “The Lord of the Rings” trilogy. He sometimes lost himself in those worlds of fantasy, but he also loved science and connected those fantasy worlds to reality and the immense galaxy of possibility surrounding us. Dad loved talking “Star Wars,” but he taught me to look up at the skies, see the constellations around us and learn how through the eons, people have found guidance and opportunity in the stars. I remember as a little kid, going to Granddaddy’s farm in Frelsburg and spending a surprisingly mild night looking up in wonder. We spent a lot of time talking about space travel – and all the fascinating things that those actual rocket scientists were figuring out. When we lost Maureen a couple of years ago, everything felt so raw and so difficult. But we found a safe space, if you’ll pardon the term, tracking the New Horizons exploratory vessel as it actually reached Pluto, and marveling at the newfound beauty of this no-longer-a-planet that was beyond human vision for so long. Just last week, a Japanese spacecraft that had failed got reprogrammed to get new angles on Neptune, and I couldn’t wait to talk to him about it and send him some links and pictures. But it was too late. Dad loved rock music – and he loved rocks. He never met a rock he didn’t like, and he found beauty in the everyday – polishing agates to bring their inner beauty to the outside, collecting mineral specimens, always on the lookout for arrowheads. He usually had at least one rock in his pockets. For all his fascination with science, Dad was weirdly thwarted by technology. He’d occasionally call me at my desk for guidance. Once, when work was still using older systems, he got a home computer that had a mouse and couldn’t make it do what it wanted. He eventually figured that out, and a couple of years ago, we finally got him to learn to text. But he could not figure out how to ignore the autocorrect suggestions, and he hated it. “Well, shut happens, I guess,” went a typical note. Dad, shut really does happen. Because here we are. But we are here to celebrate him and to remember all the things that made him him. So let’s go back to that heart of his. Dad always wanted the best for everyone, especially his family. He and Maureen loved each other so, so much, and their union brought Matthew into our lives too, turning me into a big sister, for which I will always be grateful. After my mom and dad got divorced, I never lived full-time with Dad, but I hope he knows that I treasured every single second we had together. We spent a lot of time in the car when he picked me up for weekend visits or from the airport after I moved to Oregon. We had some of our best talks in the car. We cranked up the tunes, learned about each other’s music tastes and hopefully expanded each other’s horizons a little. We talked about movies and books and life and comedy. He did indeed have a bag of rocks. The Kickler is strong with this one. 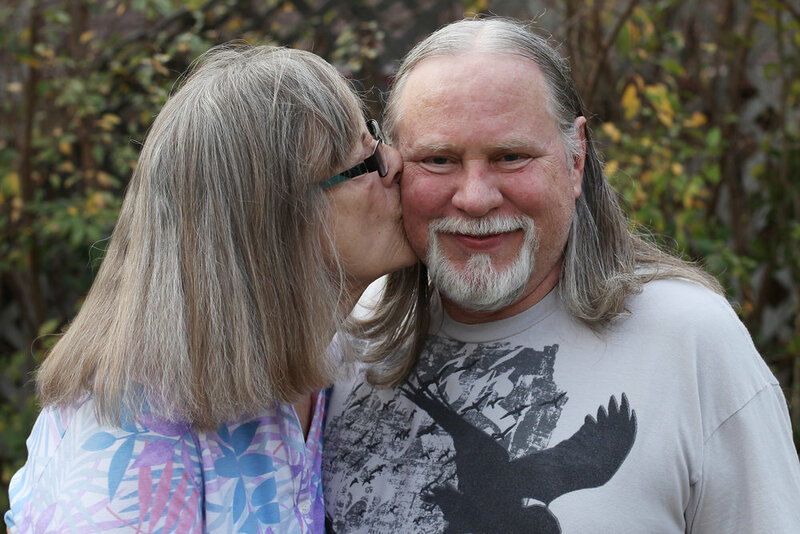 Dad’s big, open heart left him susceptible to heartbreak, and in the face of staggering losses in the past few years, especially his sweet Maureen, but also his parents and his brother, he had trouble finding the light through the clouds. I wish he’d known how many of us were rooting for him. To get out of the house, to get out of his head, to make that doctor’s appointment, to eat a good meal, to bring his goofy smile and his big hugs back out into the open. I have to believe he sees it now, that he feels our love. I have lost my tether; I feel unmoored, drifting. But while he’s gone, he’s not gone. He believed in that “star stuff” idea of Carl Sagan’s, so while I am drifting now, I’ll keep looking to the skies for his guidance. Sweet dreams, Dad. I love you, as Isaac once wrote, to New Horizons and back times infinity. Ronald Selton Kickler, a retired pharmacist with a long history serving customers at HEB, Randalls, Apple Tree and Safeway stores, died January 16, 2018, at age 65 at his home in Friendswood, Texas. Ron was born August 7, 1952, in Pasadena, Texas, to Selton Noble Kickler and Helen Cates Kickler. After graduating from Pasadena High School in 1970, he earned his bachelor’s degree from the University of Houston in 1974 and graduated from the University’s School of Pharmacy in 1976. 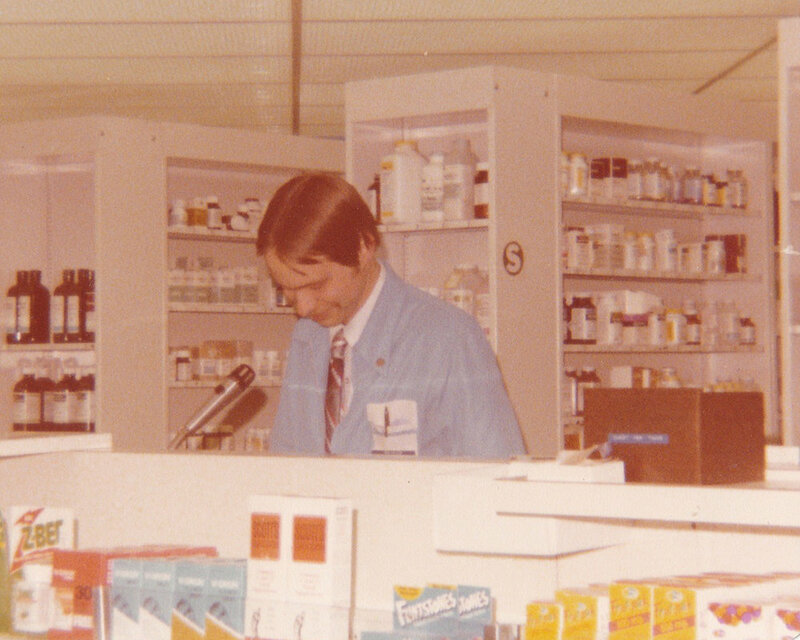 Ron was always kind to his pharmacy customers, giving them a few extra minutes to talk when he could. His listening was much appreciated, which was never more clear than during the holidays every year, when he’d bring home stacks of cards and plates full of baked goods and boxes of candy. Ron married Ann Walters in 1974, and in 1977 they welcomed a daughter, Sarah. They later divorced. He married Maureen Jones in 1985, becoming father to Matthew. 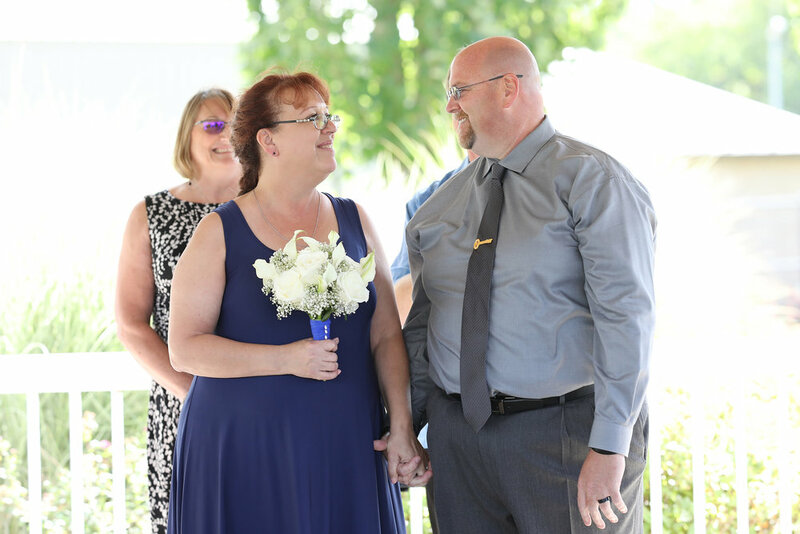 Ron and Maureen married again, for good measure, in 1996, and lived in Pearland and Friendswood over the course of their laughter-filled relationship. Ron was passionate about “Star Wars” and J.R.R. Tolkien, rereading the Lord of the Rings trilogy annually, and he taught his kids it was cool to be a nerd (before it was actually cool to be a nerd). Ron was preceded in death by his wife Maureen in 2015; his parents; and his brother, John Kickler. 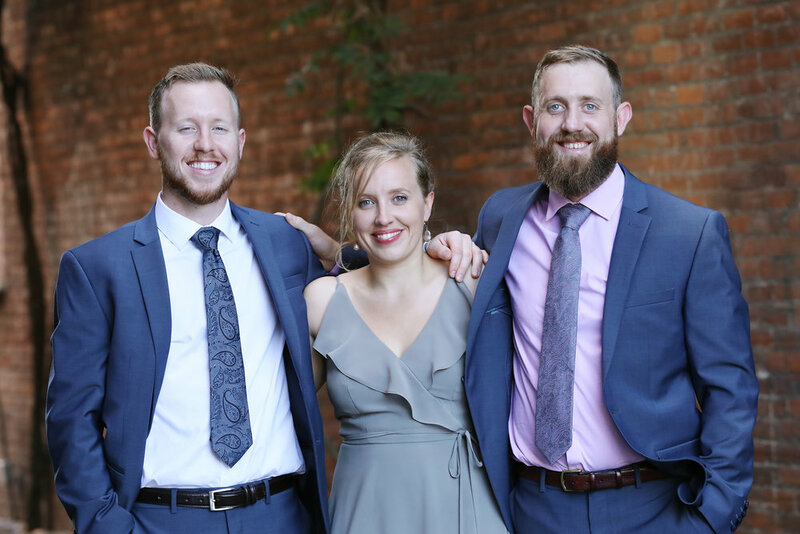 Survivors include his daughter Sarah Kickler Kelber of Salem, Oregon; son Matthew Jones of Friendswood, Texas; son-in-law Judah Kelber and grandsons Isaac and Aaron Kelber, all of Salem, Oregon. A memorial service is scheduled for 10 a.m. on Monday, Jan. 22, 2018, at Jeter Memorial Funeral Home, 311 N. Friendswood Drive, Friendswood, Texas, (281) 992-7200, with Rev. Gale Towns officiating. Please do not even consider wearing a tie. In lieu of flowers, donations may be made in Ron’s memory to the Red Cross at www.redcross.org, where he was a lifelong, multi-gallon blood donor. OK, so ... last year my Christmakkah present was an Instant Pot. We already had a stovetop pressure cooker that Judah used a ton, but it made me nervous and I didn't use it much. We weren't sure how much use the IP would actually get, but it turns out that we love it. We've used it at least once a week since last November, and often multiple times a day. Some basics: Easy hard-boiled eggs. Easy overnight steel-cut oats. Every stew that usually tastes better the next day tastes good immediately because pressure. Also, I highly recommend the Facebook community Instant Pot Recipes. It's run by my cousin-in-law Coco Morante, who also has a killer book on the topic that we gifted to several people this year. It's so good. Judah made this Texas-Style Chili con Carne recipe from Serious Eats in the pressure cooker. It. Was. Fabulous. Highly recommend. The hardest part was finding all those chiles at the store. We need to make this again stat. Judah has made of Nom Nom Paleo Bo Kho (though he used chuck instead of short ribs): Another good one. Pulled Pork Adobo from Coco's cookbook is amazing. Not linked, but in the book, the Plum Chile Chicken is also fab. Chicken Bacon Lentil Stew: A fave recent lentil stew recipe. Hasselback Pork Roast from hippressurecooking.com: It's been awhile, but this needs to happen again. Nom Nom Paleo's Braised Kale and Carrots: We have converted numerous people to kale with this recipe. Judah has also made it into a main dish by adding diced smoked chicken and sun-dried tomatoes. Shredded Italian Beef: Amazing in sandwiches or just as a main dish. Serious Eats' Chicken Chile Verde: Easy. Good. Yes. Butter Chicken: We skipped the almonds and cilantro and added tamarind. This disappeared in minutes. Salsa chicken: Some chicken, a jar of salsa, seal, cook at high pressure 12ish minutes, vent, shred. Eat on sandwiches, atop baked potatoes, on nachos, on salad, by itself. Easy and good. I'll add more as they come to mind and/or we experiment more! Sugar-free March is over. Do I get a cookie? It's been an interesting 31 days. The first thing I noticed was that sugar is in damn near everything. I mean, I knew that, but it was a different experience when I started actually looking at the labels. Nearly every bread product, every bar (Luna, Lara, Kind -- stuff I'd keep in my purse for snacks), every sauce, every dressing. Everything. So that was an eye-opening experience. The thing I was trying to test myself on the most was my on-again, off-again relationship with soda and my propensity to talk myself into desserts and other treats, instead of out of them. The second major lesson of this month is that, even though we bring very few sugary treats into the house, I am faced with them on a regular basis nonetheless: birthday cupcakes, cake, three kinds of cookies at work! Sharing a dessert at a family event! Free cookie for the kids at the grocery store -- so why don't I get one too? My latest temptation: the Jelly Belly dispenser at the office. It's not as pervasive as the "a few grams here, a few grams there" situation in every other food, but I am much more tempted by cake and cookies than salad dressing (you know, like most people). So how did I do? Some confessions: I had one Hamantaschen (the cookies typically made to celebrate the Jewish holiday of Purim) after 1) reading about them and 2) smelling the hundreds of them baked for a synagogue fundraiser. But that was a planned indulgence, and a limited one. Last week, I was at OMSI and I discovered that they carried locally made macarons. I had not even *seen* a macaron since we moved, and they are small, so I purchased one. And I savored it greatly. I had one very strange night at work where I got hives and then took two antihistamines, which made me super woozy. Nothing else was helping, and I had to get through the shift, so I went to my old standby and bought a can of Coke. I sipped it for a while until I did start to feel a little better -- maybe a quarter or a third, and I trashed the rest. Also, while I replaced most of my non-water-drinking with unsweetened iced tea (it turns out it's SO GOOD! ), I did have kombucha (fermented tea) a couple of times a week. But that was also planned. Here and there, I am sure I had sauces that had some sugar when I was at a restaurant and couldn't check, but overall, I think I did pretty well. What are my takeaways? First off, I *can* say no to sugar when I put my mind to it. There were some tough situations -- brunch at the Original Pancake House, I didn't have a single bite of pancakes, even though I was surrounded. The day I had the single hamantaschen, there were actually two more kinds of cookies going around the office. Under other circumstances, I'm sure I would have had some of that, too. I didn't really crave Coke or other soda very much. I also discovered that plain soda water, which I was drinking to help with my carbonation craving, makes me feel terrible. So back to tea and water it is! What happens next? I am not giving up sugar for good. I guaran-damn-tee you that tomorrow, I am having a salted caramel chocolate chip cookie from Great Harvest. That is happening. But I am taking my new awareness of my ability to say "no" most of the time and making that my default when faced with dessert. I will keep on with my unsweetened iced tea. I will eat some more of the yummy things I discovered when I was searching for sugar-free options. (E.g., broccoli slaw, pomegranate seeds, balsamic vinegar and olive oil is an amazing salad. Jicama strips are good with dip or without. Roasted beets are like candy! Almonds have a nice natural sweetness that's easier to notice when you're not popping jelly beans in the same hour.) I'll keep experimenting with eating clean, meal and snack planning, and trying new things. But first, hand me my cookie. On Feb. 10, just two weeks ago, we lost my grandfather Jim Walters quite unexpectedly. You can read a little bit more about him in his obituary here. At his memorial service a few days later, I found myself delivering a eulogy for him, alongside his brother, Bill, and family friend Ralph, as well as my best friend of one thousand years, Kim, who read a poem on behalf of my mom. 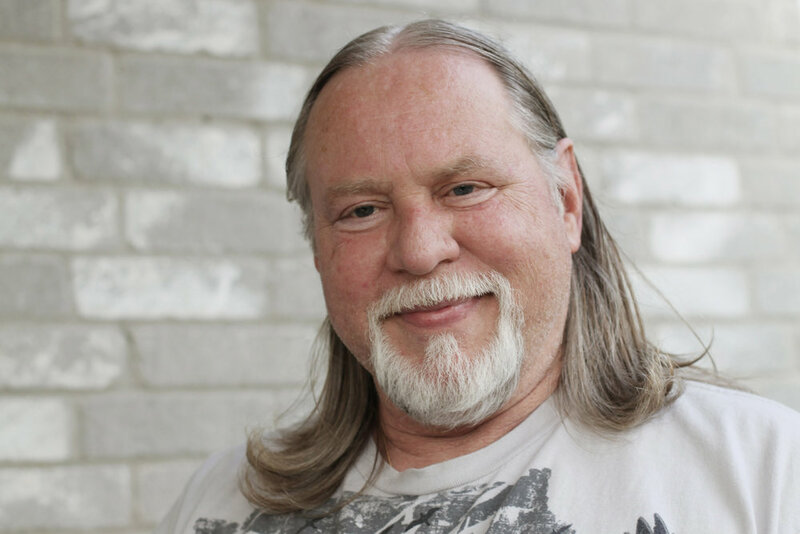 It's not like I had ever planned to deliver a eulogy for anyone, ever, but after Jim's sudden passing, I felt all these stories welling up, and I knew I'd have to write it all down even if I didn't say it. But then I decided I wanted to say it. As I tried to put it all together, though, I was lost at how to start it. That was when I heard that his former students were sharing stories on Facebook, and I was pointed toward an alumni page there to read more. Then things came together. When they were making a big deal about LSD in the news my senior year, he informed us that it was so simple to make, that even a high school chemistry teacher could make a batch and then informed us that we were NOT going to learn how. Now I want to talk a little bit about what it was like to be the granddaughter of a chemistry teacher. The first computer I ever saw was in Jimmy’s study. I didn’t know then what the term “early adopter” meant, but the sight of that Apple IIe when I was in elementary school is surely proof that he was one. Luckily for me, he was generous with his gadgets and showed me how the computer worked -- and let me play games on it, long before other kids my age got to play Oregon Trail in the computer lab at school. And just for the record, he’s the only one I know of in our family who had an iPhone 5. I’ll never forget the day he brought me a microscope -- whether it was a garage-sale find or something he’d had stashed away, I don’t know. He showed me how, even though they didn’t look that different, up close sugar crystals had their jagged edges and salt crystals were perfect cubes, functions of their chemical structures. It was a revelation that there was so much going on in the world than meets the eye. I remember Jim helping me with a science fair project and determinedly trying to teach me to use a slide rule. That last one didn’t quite work out, nor did I become a scientist, but he fostered a sense of curiosity in me that I was always be grateful for. I said at first that I wanted to talk about being the granddaughter of a chemistry teacher, but Jim was so much more -- a triathlete, for one thing, an entrepreneur, a fixer, a thinker, a solver, a joker. And he had a way of seeing the big picture that I think eludes a lot of us. Let me offer one last anecdote. About 15 years ago, when I was just starting out in my professional newspaper career, he gave me a book he’d read called “Being Digital.” This was in the late-90s, but it took a hard look at technology and what is far-reaching effects might eventually be. We talked on and off over the years about that -- how the digital world was causing a sea change in print journalism. He saw this looming on the horizon 15 years ago, but only now are newspaper people starting to wrestle with what happens next. Sometimes I think that it can be hard to see your family members for who they truly are because they are so close. But with the clarity that loss brings, as Maya Angelou so sagely noted, I feel like I can see the big picture that is my grandfather -- all the different ways he had an effect on the world. He was so steadfast and so stalwart that we’d started to think that he would always be with us, and that he was invincible. We are stunned to learn that the latter is not true, but relieved that the former most definitely is. We’ll always be his granddaughters, his students, and you his friends, his daughter, his son, his brother, his beloved wife, and all his family. I read a story the other day about scientists discovering that they could actually see the process of memories being made in the brain, some extremely groundbreaking stuff here. I am heartbroken that I won’t be able to talk to Jim about that, but I’m thankful for the chance to have made so many memories with him. Since then, I've read a few more anecdotes from his students. I can tell you that we had a chemistry lab class that was for Chemistry II in the morning before school started. I remember a couple of things about the lab. We made Nitrogen Triiodide which is a contact explosive. Weird stuff, smoked the hinges off one of the cabinets where we accidentally spilled some. Poured some in the hallway and when it dried, it would pop under peoples shoes when they walked on it. COOL! He was a very good Chemistry teacher and very patient. He had to be with me!! I blew up the lab one morning very early and he was so nice to me ... I was a mess. If we were voting for teacher of the year when we were in school, I would have voted for him. I think I made quite an impression on Mr. Walters. If he ever told a story about someone in his Biology class fainting and getting a concussion hitting the lab stool after trying to type blood. It was me. Picture poor Mr. Walters carrying me to the clinic. It was years before I ever found out my blood type. He was a wonderful teacher. Mr. Walters was the first teacher who told me I was smart and should consider a science profession. I floated on a cloud for weeks. Unfortunately, I chose a different profession but I still remember his kindness. As I mentioned in my speech, it is not always easy to get a sense of what a family member is like as a teacher, especially from a student's perspective. The classroom is its own little insular world, and getting a peek inside, especially from a generation or two away, is about as likely as turning into a literal fly on a wall. So I've been especially thankful for these stories about Jim because they give us more insight into a role he lived so long and so well but that we were not witness to. I read these, and I can picture him at the front of the classroom and see how the personality I knew as his granddaughter came through to others as his students. I've been inspired by this experience to think about the teachers who have made a difference in my life. Now it's time to reach out to them. I hope you will think about reaching out to some of your teachers, too. If you do, I'd love to hear about it in the comments. I'll report back on my conversations as well. And if you feel like sharing this on social media, why not tag it #mrwaltersproject. I can't help but feel like GPJ would get a kick out of being a hashtag. Yesterday, I posted my 1,000th Instagram picture, and today I feel like talking about it. I'd started and failed to keep up with a couple of Project 365s in the past, plus I was going to be solo parenting -- and giving birth to our second child -- while he was gone, as well as working full time and commuting. Thus, I didn't aim to take a picture a day, or really anything with any sort of regularity. But the fact of the matter was, my phone became the most reliable way to communicate with my husband (though typically not phone call ) while he was training in California or Quantico or D.C. and once he departed for Afghanistan. I never knew when I might get an email or a Facebook message or the occasional call, so quite quickly, my phone, my lifeline, became attached to me in a way it hadn't been before. And the end result of that was that my phone became the camera I was mostly likely to have with me. Yeah, Instagram sometimes gets a bad rap for its supposedly excessive filters, but I liked the ability to easily crop a photo, maybe brighten it up or add some contrast, and then share it over a few other social-media options if I wanted to (and also archive it on Flickr). Within a few weeks, my Instagram account had started to become a record of our family's deployment life. As the weeks passed, I'd find myself scrolling back through my feed, seeing Isaac get younger before my eyes and being reminded of the experiences we'd been having. Once Aaron arrived, his face joined the feed, of course, and even our family's reunion when Judah came home was also documented there. By then, Instagram was a habit, and I'm glad it has been. Going back through my 1,000 moments, I see a record of our family's everyday life, moments I wouldn't have captured with my several-pound SLR, plus things I thought were funny or just struck me in one way or another at any given time. Looking through my Flickr feed, which has many of my SLR photos with my Instagrams sprinkled among them, I notice that there is a different feel to the Instagrams. Sure, the technical quality usually isn't as good as my SLR shots, but there in those shots is my real life, sometimes a little blurry, sometimes a little overexposed, sometimes clear as day. And I'm glad to have it on record. Above are 20 of my favorites. Here you can see 100 favorites. And here's a link to my Instagram feed. It’s March 12, 2012, Judah’s first week home after getting back from Afghanistan. We’re at H-Mart, because how better to re-acclimate yourself to the U.S. than wandering around the market where whole aisles of things are marked in languages other than English? Whoa. Really? I felt like I had something to say about my experiences having a baby while Judah was far away but still connected via technology, but I wasn’t sure how to make it play in the news section. So I left. And I wrote. And wrote. And wrote some more. And a little more after that. And ended up dropping a hefty 60+-inch draft onto my editors’ metaphorical desks upon my return to the office. With some tweaks, some restructuring, a rewrite, a melding of the two versions, and a subtraction of about 25 inches of copy, thanks to the work of several editors … lo and behold, my story really did land on the front page of The Sun the Sunday before the Fourth of July. I’ve been thinking about how this all came to pass today, since I found out the essay garnered an award from the MDDC Press Association -- my first and, since I’m now outside the Maryland, Delaware, D.C. purview with our move to Oregon, my last. Thanks to her, I have this record of a period of my life that would otherwise start to fall victim to murky memory (the newborn stage has that tendency), and I got to share that with our readers. And my children will also have the longer, detailed story of that unique time in their lives, in the form of that bulky first draft. That’s only the beginning. Working with Mary -- first as a slot to her section editor, then as a section editor to her department head, then as a content editor to her editor-in-chief -- informed every bit of my career at The Sun. Everything she worked on was better because she set high expectations for herself -- and we, in turn, for ourselves. She was creative, brilliant, hilarious, kind, generous. I’m so grateful for my time with her, so angry that her time was cut so short. I just wish I could tell her thank you. For everything. Emily, Mary, me, Cheryl, Lori and Molly at Cheryl's goodbye party in, can it be, 2003? Mourning a mullet, who'd have thought? I never thought I’d find myself mourning a mullet, but last week, that’s exactly what happened. My sweet baby A had a fair amount of hair when he was born, and like most babies, he lost it (starting with an epic bald spot on the back of his head) as he got older. Or at least, he lost most of it. Along the edges, his newborn hair held on, and as the rest of his hair grew in, things just got ... unruly. Combed forward, parts were nearly an inch longer than the rest, but with no regularity. This usually blended in, though, unless too much food was applied to his 'do. In the back, the whirliest part of his whirl got longer and longer, hanging over the back of his head, which had the shortest regrowth, kind of covering his baby bald spot, even when he wasn't technically bald there anymore. And at the nape, it grew and grew -- baby in the back, big boy in the front. I knew it wouldn’t last, and at bedtime, as he grabbed a lock of my hair to twirl as he drifted off, I often found myself with a lock of his unimaginably soft baby mullet wrapped around my finger, too. After all, I was already wrapped around his finger, literally and figuratively. After a while, people started assuming he was a girl, even with his dad’s countenance right there on his own face -- even if he was wearing one of those overly gender-defining “COOL DUDE” or “100% BOY” shirts. But I didn’t care. That wasn’t the tipping point. That was when, at bathtime, all that fine baby hair lumped together and started to look like a giant rat-tail. A mullet I could deal with, but a rat-tail? I lived through that era non-ironically, and that was enough for me. That’s when I knew it was time for The First Cut. So on Friday, off we went, to an adorable place with racecar chairs for the kids, and off went the baby mullet, with a lock of it saved in a little baggie for me. With that quick trim, my baby boy is transformed, less baby, more boy. His features are emphasized in a totally different way -- his face seems more grown-up, but I think it’s just that his cheeks and ears are more noticeable without the wisps surrounding them. Where he seemed all eyes before, now his face seems more balanced, more developed. He still grabs my hair at bedtime, and I pat his sweet head, realizing it’s the baby stage I’m missing, not the mullet, as my littlest (and last) guy takes another incremental step from babyhood to boyhood. It was just a haircut, but the first cut is the deepest, even though I know that’s not what they were talking about when they wrote that song. I'm not going to lie: Since our cross-country move a few weeks ago, I've felt like something of a stay-at-home mom fail. Four days after we got here, we started researching preschools and daycares, which didn't exactly match up with my expectations of how things would be once I wasn't working at my extremely busy newspaper job of almost 14 years. But the 4-year-old, who had been in full-time daycare since he was 7 months old, was begging to go back to school, and frankly, I was already worrying that he was going to lose his school routine, and possibly some of his reading and writing skills, before starting kindergarten this fall. And if I'm going to launch my photography business here and do freelance work as planned, clearly, I'll need time for that. But still. I thought we'd last at least a week. But it is part-time, so yesterday, one of their home days, I thought we'd have a ton of fun -- the park since it was sunny, some drawing, some reading, maybe a picnic ... the possibilities were endless. Until the 4-year-old woke up with a serious case of boundary busting. I want to watch another showwwwww! I want another snaaaaaack! I don’t want to go outsiiiiiiiiiide! I just want to be by myselllllllllf! I mean, in a way, I can hardly blame him: His routine that's lasted most of his life has been completely undone. He just left all his friends. We're in a new and unfamiliar house. I'd be freaking out, too. But still, no. The last straw was when my mom came over, and he was stomping around saying he wanted her to leave. Nuh-uh. Not OK. The plan changed: Baby would stay with my mom, and I'd take the boy out for some one-on-one time. Stat. But first, I'd have to install the gargantuan car seat in my mom's car, during which I bashed myself in the side of the head with it -- hard -- and burst into tears of pain, a little, but frustration mostly. Argh. I don't know if it was seeing me frustrated too that turned him around, but the kiddo kind of got it back together at that point. Before we left, he told my mom that actually, he wanted her to come over every day, and he was excited about our outing. We had fun walking around the grocery store and getting our bearings before picking out our lunch. He was a total sweetheart while we were eating, bursting with questions and telling me all about his new school, his energy now bubbling out positively instead of negatively. Ahhhh, better. Walking through the produce section, I caught sight of some positively gorgeous rainbow carrots. "Look at these!" I told him. "Did you even know carrots came in this many colors?" He was fascinated, and I had a brainstorm. We'd get them and cut them up and have a taste test -- a scientific experiment, if you will. Brilliant! Later, at home, I asked if he wanted to help me clean them up, and he said no thanks. So I washed them and scraped them. When I cut open the purple carrot, I saw it was pale orange in the middle. "Hey, check this out! Did you know it was going to be different colors in the center? Cool, huh?" Neat, Mom. (Whatever, Mom.) Then I cut them into sticks and offered them up for the taste test -- and got another no thank you. Wind out of my sails, I started mindlessly slicing the carrots into rounds and before I realized what I was doing, I'd arranged them into a pattern on the cutting board. "Hey, that's cool," I thought. "Almost like an art project you'd do with your kid. If your kid wanted to participate." He later tried a few of the carrots, and the rest went into the night's beef stew. And I don't know, the mere creative act of making something pretty out of something unexpected made me happy, even if it didn't meet my initial "do something creative with the kids" expectation. We're figuring this being-at-home stuff out together, even if it's only part-time. Together was kind of the point, right? Memories or memory card? Why not both? A year ago today, my husband returned from Afghanistan and was reunited with our son Isaac, then 3, and met our newborn, Aaron. In that moment, I faced a familiar struggle: Be in the moment or document the moment? Logistics won out, at least at first. After Judah stepped off the bus, I hung back with Aaron and let Isaac be the first to welcome his dad home. Holding the baby, I couldn’t really handle the camera, so I just stood there and soaked it in as the two of them apprised each other and then hugged. Then Judah and I locked eyes and I said something silly like, “I have someone I’d like you to meet.” I handed Aaron to Judah and just watched them look at each other. Aaron, nearly 10 weeks old, gazed at his dad, then started crying. Despite my best efforts, the bus had arrived at mealtime. I passed over a bottle and let Judah take over feeding duties for a few minutes until Aaron calmed down. He didn’t want to let go, and besides, it was his turn. Then, hands unexpectedly free, I just couldn’t resist documenting the scene that was unfolding before me and committed a few images to my memory card, not just my memory. Isaac ran around my legs as I captured the picture of Judah in uniform, nuzzling Aaron’s forehead, with Aaron giving a tiny, contented smile. It’s probably the most meaningful photograph I’ve taken to date, which made me realize that for me, documenting the moment is part of being in the moment. It adds to the experience; it doesn’t distract, doesn’t detract. The lesson instead is that when I can’t manage the camera, I will be there completely and take it all in, rather than worrying about missing the shot. I might not have a canvas print of Judah and Isaac’s reunion, but it’s seared on my memory all the same. Note: Adapted from a draft of this essay. When my now-husband and I moved out to the East Coast in 1999, we were convinced it would be temporary. A couple of years, maybe a couple more, but after that, we'd be headed somewhere else. For sure. No doubt. I guess nearly 14 years counts as temporary somewhere. But finally we are headed somewhere else -- back home to Oregon, to be near our families and back in the part of the world we're so passionate about. So in a month or so, we'll be all packed up (or at least, we'd better be!) and off to new horizons.